While there are many chiropractic techniques that mobilize the spine, our office uses techniques that are designed to correct the spine through the use of modern adjusting techniques combined with specialized physical therapy. Our primary goal is to provide quick relief to our patients; however, spinal correction confirmed by post x-rays is essential to prevent relapse and maintain optimal health. It is not practical to assume correction can occur without addressing the ligaments and tendons of the spinal column. Our office uses the Pettibon System of rehabilitation to help our patients achieve maximum mobility, find relief from pain, and hold their adjustments better. The spine is viewed as a closed kinetic system made up of hard and soft tissues. The soft tissues—muscles, discs, and ligaments—hold the spine upright in its optimum position for function relative to gravity, while also moving it through its expected ranges of motion. As a result, spinal correction has to involve the entire spine rather than just one segment or vertebrae. For example, if a ligament is torn in the lumbar spine, this injury can cause aberrant motions which often create pain and dysfunction in other areas of the spine, such as the neck. The neck pain and dysfunction won't be resolved until the torn ligament and aberrant motion in the lumbar spine are treated first. Hysteresis: A phenomenon associated with energy loss exhibited by viso-elastic materials when they're subjected to progressive loading and unloading cycles over time. Ligaments, discs, and tendons have holding energy. Loading and unloading cycles through compression and traction cause the temporary loss of this energy or "hysteresis." Hysteresis changes the nucleus pulposis of the discs from hydro-gel (a Jell-O like substance resistant to motion) into hydro-sol (water-like solutions with limited resistance to positional changes.) When the soft tissue's resistance is significantly reduced, the joints can easily be repositioned before the holding energy is regained. Within 15 to 20 minutes of inactivity, the holding energy is regained. Our office uses a series of decompression, traction, flexibility, and mobility activities to achieve hysteresis so that the body's posture can be corrected. THE BOTTTOM LINE: If we warm up the spine properly, it can be corrected. Two kinds of muscle fibers make up the musculoskeletal system. One is fast-twitch muscle fiber and the other is slow-twitch muscle fiber. Muscles have both types of fibers but usually one fiber type dominates a muscle group. Our postural muscles have mostly slow-twitch fiber. In the gym, when we're lifting weights or doing aerobic exercises, we're affecting fast-twitch muscle fiber or phasic muscles. These movements don't affect our postural muscles very much; therefore, exercises to strengthen phasic muscles don't generally work when trying to improve posture. When phasic muscles fatigue and/or when they're injured, they go flaccid and collapse. Postural muscles react very differently from phasic muscles when they're injured or fatigued--they spasm. And the way postural muscles spasm is rarely even, either side-to-side or front-to-back. This is why poor posture tends to distort our appearance...because our spine is no longer aligned. Isometric exercises, which involve pushing against a force that moves very slowly or doesn't move at all, help eliminate postural muscle spasms as well as rehabilitate their balance, strength, and endurance. Individual isometric exercises are developed for our patients based on their unique x-ray findings. THE BOTTOM LINE: Strengthening fast-twitch muscle groups cannot change your posture. Posture can only be changed by addressing the slow-twitch ligaments and tendons of the spine. The Pettibon Weighting System in our office consists of specially designed head, shoulder, and hip weights that patients wear. The amount of weights and their placement depend upon the spinal displacement that needs to be corrected. How the weights work: Wearing the weights alters the head's, thoracic cage's, and pelvis' centers of mass, causing the body's righting reflexes to send spine correcting sensory input to the nervous system. To balance the body to the weights, the nervous system's innate organizing energy causes certain involved spinal muscles to relax and others to contract, thereby repositioning and correcting the spine and posture relative to gravity. Additionally, the weights cause the involved muscles to perform isometric exercises, which help restore strength, endurance, and balance. THE BOTTOM LINE: If we strengthen the body in its corrected position, it will assume that position. Once the spine is prepared for its adjustment, specific low force adjustments can be used to make the proper corrections in a controlled maneuver that does not require rotating or twisting of the spine. Our adjustments are effective, safe, and extremely comfortable. Most of our patients confirm that they do not have any discomfort with our treatments. THE BOTTOM LINE: Our office utilizes non-rotational adjustment techniques in order to deliver the safest, most comfortable adjustments possible. In order to determine if a correction has been obtained, there are a number of factors to consider. For one, the x-rays must be consistent and accurate. Our office uses a laser aligned unit and centering head clamps to ensure that our films are as accurate as possible. Once the films are developed, principals of physics and geometry are used to interpret the films and create the correction plan. Confirming a correction is an essential part of the healing process; therefore, post x-rays are taken at designated times to ensure results. 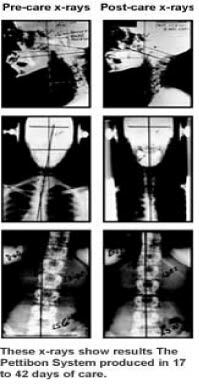 All x-rays are reviewed with our patients and evaluated in order to determine each patient's progress. THE BOTTOM LINE: Post x-rays help our doctors to deliver the most accurate care possible, while also tracking a patient's progress.